What's So Interesting About Barley? Barley, domesticated around 10,000 years ago, is the fifth most important cereal worldwide, used for food, feed, and drink. With human intervention, barley changed from a shattering, two-rowed variety to today’s non-shattering, two- and six-rowed varieties. Modern barley improvements involve crossing to wild varieties, mutation breeding, and the use of contemporary tools of genomics and genetics. Photo credit: NASA Earth Observatory. Barley—its official Latin name, Hordeum vulgare—is a member of the Triticeae tribe in the Gramineae family. 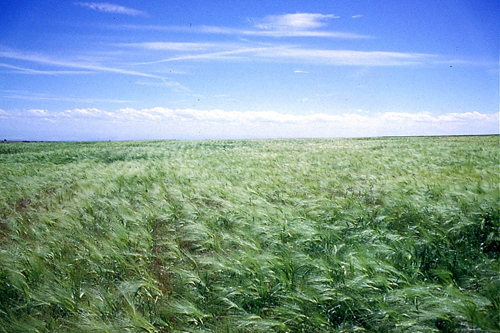 Triticeae also include other economically important crops like wheat, rye, and triticale. It is believed that domesticated barley had its beginnings about 10,000 years ago in the Fertile Crescent, a region in the Near East often considered to be the cradle of civilization. In terms of its physical appearance, the seed head of modern cultivated barley is characterized by three individual flowers, located at individual swellings or nodes on the flower stem, that develop into seeds after fertilization. 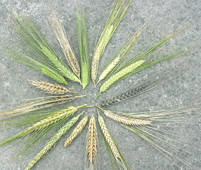 In six-row barley, all three flowers are fertile and develop into seed (Fig. 1, right), but in two-rowed barleys only the central flower is fertile and develops into seed (Fig. 1, left). Figure 1. Two-row and six-row barley. Photo credit: Brian Steffenson, University of Minnesota. The barley variety H. spontaneum (Fig. 2) is believed to be the wild relative of domesticated barley. It is a two-row barley that has a small brittle stem, or rachis, that holds the grain on the plant. The brittle stem in the wild variety was important because it allowed seeds to break off easily from the wind or animal contact, drop to the ground, and germinate to begin the next growing cycle. An important event in domestication of barley and wheat, which have similar structures, involved a mutation that made the stem holding the flower—and ultimately the seed—no longer brittle. About 19,000 years ago, it is believed that humans gathered wild, shattering two-row barleys; the non-shattering forms appeared about 9,500 years ago. Although non-shattering varieties are not favored in the wild, this trait became valuable when barley came under cultivation and became the predominant variety due to selection by humans. Figure 2. 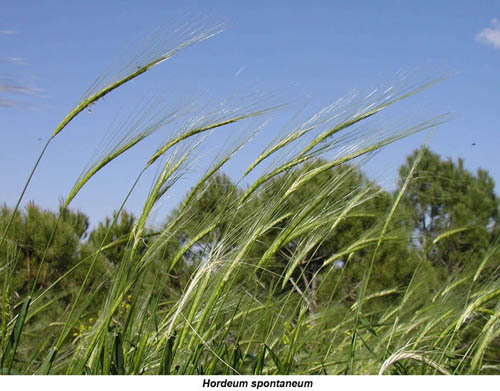 Hordeum spontaneum. Photo credit: Brian Steffenson, University of Minnesota. Seed germination, plant growth, seed set, and harvest comprise the life cycle of barley. The grower and certain end users (e.g. maltsters) are particularly interested in seed germination and seed set to assure optimal yield of grain. So what does that seed look like? It is composed of the seed or grain borne on the spike, the mature ovary wall, the seed coat, a thin layer around the starchy endosperm, and the embryo, which gives rise to the roots and shoots of the next generation plant. When the dry seed takes up water, the seed cracks open, and the roots and shoot appear. For barley, uniform germination is important to establish the crop in the field, but it is also key to the malting process used for making beer and whiskey. Following germination, the stem elongates, leaves are produced, and tillers—secondary shoots—appear. Seed is borne on the end of spikes that contain both the male (pollen-bearing anthers) and female (egg-bearing ovary) reproductive organs (Fig. 4). 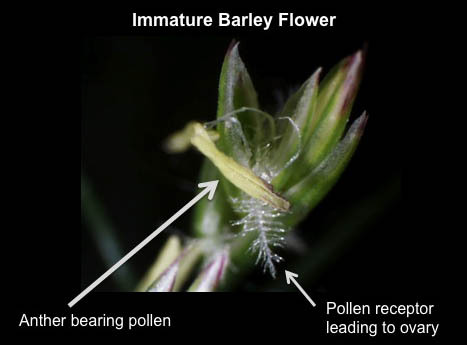 Fertilization of the egg by the pollen occurs predominantly before the structures emerge from the stalk, and thus barley is termed a self-pollinating crop. Figure 4. Immature barley flower. Photo credit: Max Teplitski, University of Florida. How Much Barley and For What? In 2009, over 3 million acres of barley were harvested in the U.S., yielding over 200 million bushels (USDA-Economic Research Service, 2010). Worldwide, barley ranks fourth among cereal crops, after maize, wheat, and rice, and ahead of sorghum, oats, and rye. Its production in 2009 was at 150 million tons and the area cultivated was on over 2 million square miles (FAO, 2010), roughly 60% the size of the United States. It is grown under diverse environmental conditions, from temperate zones to high altitudes. Barley has been an important crop for food, feed, and drink since agricultural domestication occurred. In the U.S. its greatest economic importance is for malting and brewing (Malting & Brewing fact sheet) and for animal feed, but it is also used as an important food in some parts of the world. In 2008, FDA approval of claims that eating barley can lower cholesterol increased interest in barley as a healthy food (Food fact sheet). Figure 5. Barley field. Photo credit: Patrick Hayes, Oregon State University. Since early in history, primitive gatherers started to identify useful characteristics in plants, intentionally choosing them to make crosses to improve the crop’s taste and ease of harvest. The process by which these plants were manipulated and selected could be viewed as the beginnings of plant breeding, which became more directed and sophisticated over time. Figure 6. Diversity of barley. Photo credit: Kevin Smith. The need for plant breeding was precipitated by the gradual erosion of genetic diversity in cultivated varieties. This led to the need to identify new sources of variability—pre-existing as well as human-generated. One approach to identifying new sources of variability is screening for mutations that result in new traits, a practice termed mutation breeding. 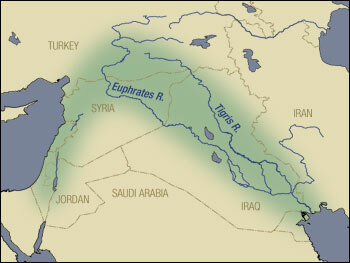 The most famous example of this approach’s impact was the introduction of dwarf wheat and rice, resulting in the increased yields of the Green Revolution. Mutation breeding in barley started in 1943 and today some 256 mutant barley varieties are available in the IAEA Mutant Varieties Database (FAO/IAEA, 2007). Induced mutations were generally aimed at development of disease resistant and high-grain-protein varieties. More recently, more directed approaches at generating mutations have been used, such as TILLING (Targeting Induced Local Lesions IN Genomes) and transposon-based mutagenesis. Another approach widely adopted in barley breeding is doubled haploid technology. In this method, two identical forms of a gene are achieved by doubling the chromosome after producing a plant from a haploid tissue, like male pollen or female egg, thus speeding the breeding process. Breeders have also used wild varieties for wide crosses to identify valuable traits for incorporation into new cultivars. In barley, these crosses have involved H. bulbosum and H. spontaneum. Agronomic traits for disease resistance and stress tolerance have been expressed in progeny from these crosses. In searching through progeny, breeders have focused on producer- and consumer-desired traits, also with careful attention to yield (Breeding Fact Sheet). Because of its special use in malting, barley breeders also watch carefully for certain grain characteristics related to malting quality and protein content. Figure 7. 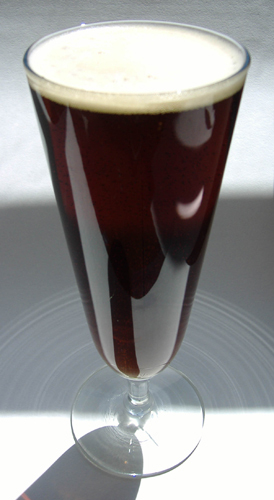 Dark beer. Photo credit: Rosemary Alonso. Progress in breeding has gained momentum recently with the focus on so-called marker-assisted breeding using DNA markers. Incorporation of a desirable new trait into a variety can now be accomplished more quickly in breeding programs that have embraced the molecular marker-based breeding approach (MAS Fact Sheet) being championed by Barley CAP researchers. The most recent genetic approach to barley improvement involves engineering using recombinant DNA technologies. This technology opens up access to genes from organisms other than Hordeum species. USDA Economic Research Service. 2010. Corn, sorghum, barley, and oats: Planted acreage, harvested acreage, production, yield, and farm price [Online]. Feed grains data: Yearbook tables. USDA Economic Research Service. Available at: http://www.ers.usda.gov/Data/Feedgrains/Table.asp?t=01 (verified 1 Mar 2012). FAO/IAEA. 2007. IAEA mutant varieties database [Online]. Mutation enhanced technologies for agriculture. International Atomic Energy Agency. Available at: http://mvgs.iaea.org/AboutMutantVarieties.aspx (verified 1 Mar 2012). FAO. 2010. FAOSTAT [Online]. Food and Agriculture Organization of the United Nations. Available at: http://faostat.fao.org/site/567/DesktopDefault.aspx?PageID=567#ancor (accessed 1 Mar 2012). Lemaux, P. G. 2007. Barley: It's what's for dinner. Barley Coordinated Agricultural Project. (Available online at: http://barleycap.cfans.umn.edu/pdfs/Food_qualityFactsheet.pdf) (verified 1 Mar 2012). Hertsgaard, K., and P. Schwarz. 2008. Barley, malt and beer. Barley Coordinated Agricultural Project. (Available online at: http://barleycap.cfans.umn.edu/pdfs/MaltingFactsheet.pdf) (verified 1 Mar 2012). Lemaux, P. G. 2007. Plant breeding: The path forward. Barley Coordinated Agricultural Project. (Available online at: http://barleycap.cfans.umn.edu/pdfs/BreedingFactsheet.pdf) (verified 1 Mar 2012). Lemaux, P. G. 2008. Marker-assisted selection. Barley Coordinated Agricultural Project. (Available online at: http://barleycap.cfans.umn.edu/pdfs/MASFactsheet.pdf) (verified 1 Mar 2012). For more information regarding barley research and the Barley CAP project, please visit http://www.barleycap.org.